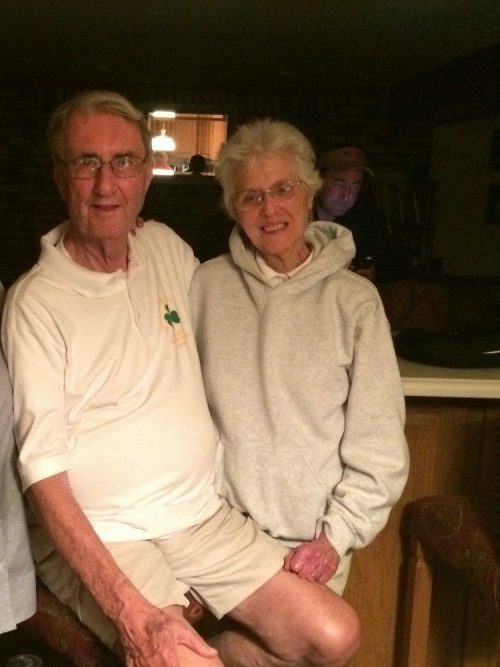 After 66 years of marriage, illness separated Mary and Kevin R. Connors of Angola. Then it brought them together at the end of their lives. The couple, whose name became synonymous with summertime in Angola thanks to the hot dog stand that Kevin Connors' father started 75 years ago, died four days apart this month. "It was just an old school romance that never ended," said Mr. Connors' sister, Karen Connors Erickson. Mr. Connors, 89, a retired Buffalo police inspector and one of the owners of Connors Hot Dog Stand, was in rehab after breaking his leg, and Mrs. Connors, 87, who had been in failing health for about a year, had been admitted to Buffalo General Hospital in late January. Mr. Connors developed an infection right before he was to be discharged, and was taken to Buffalo General Hospital March 10. But it was a fortunate turn in one sense: He was able to see his wife, who was dying. "They wheeled him over to see how she was doing," said Mr. Connors' brother, William. "She knew he was there and smiled and squeezed his hand," Karen Connors Erickson said. He was wheeled over the next day, and was holding his wife's hand when she died March 13, Erickson said. Mr. Connors died unexpectedly four days later, on St. Patrick's Day. He and his sons had watched the Buffalo Sabres hockey game on television, and the sons left the hospital, only to get a call later that evening. Mr. Connors told his sister that after his wife died, he had no more reason to live. But then he added that he did not want his children to go through losing both parents so close together. The family thought that he had rallied. "We weren't expecting him to die," William Connors said. Their deaths are a big loss for the Connors clan, many who live in a small enclave on Lake Shore Road near the hot dog stand. "He has lived next-door to me most of his life," William Connors said. "We will always remember Aunt Mary in her kitchen window looking out at us as she washed dishes. At the age of 87, she was still cutting the pickles that we all love and making the Texas sauce for the hot dogs at the stand. Every day Aunt Mary was smiling and is still smiling as she watches over us," reads a post on the hot dog stand's Facebook page. The former Mary A. Bauer grew up in Buffalo and graduated from Kensington High School. She enjoyed keeping her house and raising four sons, preparing three meals a day until she got ill. And she never learned to drive. "She never had a driver's license. She was the last of her kind," William Connors said. The hot dog stand, which is celebrating its 75th year this year, was started by Thomas E. Connors Sr. in 1944 so Kevin, his oldest son, could earn money for college. It has been the go-to summer job for Thomas' 20 grandchildren and 40 great-grandchildren and others ever since. Kevin Connors graduated from Canisius College in 1951, and then served in the U.S. Coast Guard for two years. He joined the Buffalo Police Department in 1954, holding every Civil Service rank in the department. He was chief of detectives, and served as inspector for 20 years before retiring in 1993. He also worked at the hot dog stand behind the counter for years. "When he got to be inspector, I told him he's too high a rank to be cooking hot dogs," William Connors said. Neither William Connors nor Erickson could remember how the couple met. William Connors said Kevin and Mary were each other's first boyfriend and girlfriend, and met while Kevin was attending Canisius College. At their 65th anniversary party and on other occasions, Mr. Connors said, "I married the most beautiful girl in the world." They did many things together, from attending family weddings and graduations, attending Mass, to shopping, and even reading the Sunday paper while sitting next to each other on the couch. "When Aunt Mary and Uncle Kevin showed up, you felt like everyone was there," Erickson said. "Their family was it. They didn’t join clubs, they didn't belong to organizations," William Connors said. They are survived by four sons, Kevin Jr., Michael, John Jay and Mark, and three grandchildren. Mrs. Connors is also survived by her twin brother, Edward Bauer. Mr. Connors is also survived by a brother, William, and sister, Karen Erickson. A Mass of Christian Burial will be offered at 10 a.m. Tuesday at Most Precious Blood Catholic Church, 22 Prospect Ave., Angola.